I am looking for a large, family type of tent, like a Columbia Cougar Flats II or a Eureka Copper Canyon...160 +/- on the footage. My question is this: What will hold up to the Gulf Coast constant wind around the Corpus Christi/PINS area? I've tried an Ozark tent and other big box store tents and they have barely made it thru a trip or two...please give any advice you may have. Thanks, Scott Answer: Hi, Scott! Thanks for your question. Wind is something that a lot of new campers never think about. In my opinion, it's much more important to find a tent that can stand up to the wind, than one that will offer extreme privacy or a super sturdy footprint. It's especially important for folks who like to camp in high-wind areas--like you--to get tents that can counteract a dangerous breeze. Or, at the very least, they should know a few tips for handling the wind. And, hey, that's what I'm here for! Low Tents-- The higher the tent, the easier it will be damaged by wind. Unfortunately, this means that most family-sized tents are in danger because their peak heights generally average between 6' and 7'. Obstructions -- You can try placing your tent next to a natural obstruction--such as a rock wall--in order to block the wind. If there's nothing available, try masking it with hay bales, snow fencing, or your car. DIY Stakes-- If you camp a lot in high-wind areas--like Corpus Christi/PINS--think about creating your own stakes made from rebar. These heavy-duty accessories will help keep your shelter in one place. Overall Caution-- When camping in the wind, the best thing you can do is just stay aware. Don't try to erect or tear down your tent in the wind, or else you might injure the gear or yourself. Also, be sure to frequently check your stakes--they can get pushed around a lot in high winds and come a little loose. Just be careful and keep your common sense close at hand. Unfortunately, I don't know of any big, family-sized tents that are guaranteed to hold up in the high winds you're talking about. The problem is with the height. My suggestion? Pick up two smaller tents and divide your people among different shelters. This way you can all still camp together, but you get the added benefit of shorter peak heights. If, however, you're set on getting a large tent, take a look at the list below. These are some of the absolute best out there. If you tie that rainfly down as taut as taut can be, the following three tents may fix all your problems on the high-wind grounds of Corpus Christi/PINS. I can't guarantee they won't deteriorate over time--I still suggest getting two smaller shelters to combat the wind the most effectively--but they should stand up well to nasty conditions. 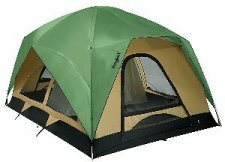 Eureka Copper Canyon 12 Tent -- Eureka's Copper Canyon is certainly worth being on your radar. It's tall--a peak height of 7'--but it also comes with a pretty decent rainfly that can deflect wind if staked down properly. It features 168 square feet of interior space, which is nearly unbeatable in the industry. Overall, this is a really good, though not great, purchase for large families. You can read our full review of the Eureka Copper Canyon tent here. Eureka Tetragon 10 Tent-- This one offers the same square footage as the Copper Canyon--even though it's designed for two less people. But the best thing about it is the aerodynamic design of its construction. This one will certainly work well in high winds. You can read our full review of the Eureka Tetragon 1210 tent here. The North Face Mountain Manor 8 Bx Tent -- The Mountain manor is a little under your floor area target--it boasts just 120 square feet--but it's much tougher than either of the Eureka shelters. The North Face is an expensive brand, but their goods are more than worth it. This tent is also a bit on the heavy side, but it's as tough as they come, and that's what you want in high-wind areas. Let me know which you decide and if it stands the high-wind test! But I sincerely believe that if you pay special attention to the tips above and really tie down that tarp, you should be golden. Have a blast!